The French Revolution gave rise to the metric system, and this has spread around the world, replacing most customary units of measure. In most systems, length (distance), mass, and time are base quantities. Later science developments showed that either electric charge or electric current could be added to extend the set of base quantities by which many other metrological units could be easily defined. (However, electrical units are not necessary for such a set. Gaussian units, for example, have only length, mass, and time as base quantities, and the ampere is defined in terms of other units.) Other quantities, such as power and speed, are derived from the base set: for example, speed is distance per unit time. Historically a wide range of units was used for the same type of quantity: in different contexts, length was measured in inches, feet, yards, fathoms, rods, chains, furlongs, miles, nautical miles, stadia, leagues, with conversion factors which were not powers of ten. Such arrangements were satisfactory in their own contexts. The preference for a more universal and consistent system (based on more rational base units) only gradually spread with the growth of science. Changing a measurement system has substantial financial and cultural costs which must be offset against the advantages to be obtained from using a more rational system. However pressure built up, including from scientists and engineers for conversion to a more rational, and also internationally consistent, basis of measurement. In antiquity, systems of measurement were defined locally: the different units might be defined independently according to the length of a king's thumb or the size of his foot, the length of stride, the length of arm, or maybe the weight of water in a keg of specific size, perhaps itself defined in hands and knuckles. The unifying characteristic is that there was some definition based on some standard. Eventually cubits and strides gave way to "customary units" to meet the needs of merchants and scientists. In the metric system and other recent systems, a single basic unit is used for each base quantity. Often secondary units (multiples and submultiples) are derived from the basic units by multiplying by powers of ten, i.e. by simply moving the decimal point. Thus the basic metric unit of length is the metre; a distance of 1 m is 1,000 millimetres, or 0.001 kilometres. Metrication is complete or nearly complete in almost all countries. US customary units are heavily used in the United States and to some degree in Liberia. Traditional Burmese units of measurement are used in Burma. U.S. units are used in limited contexts in Canada due to the large volume of trade; there is also considerable use of Imperial weights and measures, despite de jure Canadian conversion to metric. A number of other jurisdictions have laws mandating or permitting other systems of measurement in some or all contexts, such as the United Kingdom – whose road signage legislation, for instance, only allows distance signs displaying imperial units (miles or yards) – or Hong Kong. In the United States, metric units are used almost universally in science, widely in the military, and partially in industry, but customary units predominate in household use. 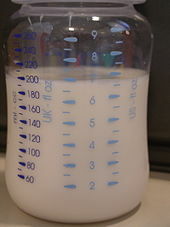 At retail stores, the liter is a commonly used unit for volume, especially on bottles of beverages, and milligrams, rather than grains, are used for medications. Some other standard non-SI units are still in international use, such as nautical miles and knots in aviation and shipping. Multiples and submultiples of metric units are related by powers of ten and their names are formed with prefixes. This relationship is compatible with the decimal system of numbers and it contributes greatly to the convenience of metric units. In the early metric system there were two base units, the metre for length and the gram for mass. The other units of length and mass, and all units of area, volume, and derived units such as density were derived from these two base units. Mesures usuelles (French for customary measurements) were a system of measurement introduced as a compromise between the metric system and traditional measurements. It was used in France from 1812 to 1839. A number of variations on the metric system have been in use. These include gravitational systems, the centimetre–gram–second systems (cgs) useful in science, the metre–tonne–second system (mts) once used in the USSR and the metre–kilogram–second system (mks). The current international standard metric system is the International System of Units (Système international d'unités or SI) It is an mks system based on the metre, kilogram and second as well as the kelvin, ampere, candela, and mole. The SI includes two classes of units which are defined and agreed internationally. The first of these classes includes the seven SI base units for length, mass, time, temperature, electric current, luminous intensity and amount of substance. The second class consists of the SI derived units. These derived units are defined in terms of the seven base units. All other quantities (e.g. work, force, power) are expressed in terms of SI derived units. Both imperial units and US customary units derive from earlier English units. Imperial units were mostly used in the former British Empire and the British Commonwealth, but in all these countries they have been largely supplanted by the metric system. They are still used for some applications in the United Kingdom but have been mostly replaced by the metric system in commercial, scientific, and industrial applications. US customary units, however, are still the main system of measurement in the United States. While some steps towards metrication have been made (mainly in the late 1960s and early 1970s), the customary units have a strong hold due to the vast industrial infrastructure and commercial development. While imperial and US customary systems are closely related, there are a number of differences between them. Units of length and area (the inch, foot, yard, mile etc.) are identical except for surveying purposes. [clarification needed] The Avoirdupois units of mass and weight differ for units larger than a pound (lb). The imperial system uses a stone of 14 lb, a long hundredweight of 112 lb and a long ton of 2240 lb. The stone is not used in the US and the hundredweights and tons are short: 100 lb and 2000 lb respectively. Where these systems most notably differ is in their units of volume. A US fluid ounce (fl oz), about 29.6 millilitres (ml), is slightly larger than the imperial fluid ounce (about 28.4 ml). However, as there are 16 US fl oz to a US pint and 20 imp fl oz per imperial pint, the imperial pint is about 20% larger. The same is true of quarts, gallons, etc. Six US gallons are a little less than five imperial gallons. The Avoirdupois system served as the general system of mass and weight. In addition to this there are the Troy and the Apothecaries' systems. Troy weight was customarily used for precious metals, black powder and gemstones. The troy ounce is the only unit of the system in current use; it is used for precious metals. Although the troy ounce is larger than its Avoirdupois equivalent, the pound is smaller. The obsolete troy pound was divided into 12 ounces, rather than the 16 ounces per pound of the Avoirdupois system. The Apothecaries' system was traditionally used in pharmacology, but has now been replaced by the metric system; it shared the same pound and ounce as the troy system but with different further subdivisions. Natural units are physical units of measurement defined in terms of universal physical constants in such a manner that selected physical constants take on the numerical value of one when expressed in terms of those units. Natural units are so named because their definition relies on only properties of nature and not on any human construct. Various systems of natural units are possible. Geometric unit systems are useful in relativistic physics. In these systems the base physical units are chosen so that the speed of light and the gravitational constant are set equal to unity. Planck units are a form of geometric units obtained by also setting Boltzmann's constant, the Coulomb force constant and the reduced Planck constant to unity. They are based only on properties of free space rather than any object or particle. Stoney units are similar to Planck units but set the elementary charge to unity and allow Planck's constant to float (i.e. it is a number that has to be determined by experiment). "Schrödinger" units are also similar to Planck units and also set the elementary charge to unity, but allow the speed of light to float. Atomic units are a system of units used in atomic physics, particularly for describing the properties of electrons. The atomic units have been chosen such that several the constants relating to the electron are all equal to one. They are similar to "Schrödinger" units but set the electron mass to unity and allow the gravitational constant to float. The unit of energy in this system is the total energy of the electron in the Bohr atom and called the Hartree energy. The unit of length is the Bohr radius. Electronic units are similar to Stoney units but set the electron mass to unity and allow the gravitational constant to float. They are also similar to atomic units but set the speed of light to unity and allow Planck's constant to float. Quantum electrodynamical units are similar to the electronic system of units except that the proton mass is normalised rather than the electron mass. The American football field, which has a playing area 100 yards (91.4 m) long by 160 feet (48.8 m) wide. This is often used by the American public media for the sizes of large buildings or parks. It is used both as a unit of length (100 yd or 91.4 m, the length of the playing field excluding goal areas) and as a unit of area (57,600 sq ft or 5,350 m2), about 1.32 acres (0.53 ha). Larger areas are sometimes expressed as a multiple of the areas of certain American states, or subdivisions of the UK etc. A ton of TNT equivalent, and its multiples the kiloton, the megaton, and the gigaton. Often used in stating the power of very energetic events such as explosions and volcanic events and earthquakes and asteroid impacts. A gram of TNT as a unit of energy has been defined as 1000 thermochemical calories (1,000 cal or 4,184 J). A unit of measurement that applies to money is called a unit of account in economics and unit of measure in accounting. This is normally a currency issued by a country or a fraction thereof; for instance, the US dollar and US cent (​1⁄100 of a dollar), or the euro and euro cent. Throughout history, many official systems of measurement have been used. While no longer in official use, some of these customary systems are occasionally used in day-to-day life, for instance in cooking. ^ "Statutory Instrument 2002 No. 3113 The Traffic Signs Regulations and General Directions 2002". Her Majesty's Stationery Office (HMSO). 2002. Retrieved 18 March 2010. ^ M. Ismail Marcinkowski, Measures and Weights in the Islamic World. An English Translation of Professor Walther Hinz's Handbook "Islamische Maße und Gewichte", with a foreword by Professor Bosworth, F.B.A. Kuala Lumpur, ISTAC, 2002, ISBN 983-9379-27-5. This work is an annotated translation of a work in German by the late German orientalist Walther Hinz, published in the Handbuch der Orientalistik, erste Abteilung, Ergänzungsband I, Heft 1, Leiden, The Netherlands: E. J. Brill, 1970.